The information technology allows, through the translation memory technology, to speed up, streamline and make a translation more uniform. How is this possible? 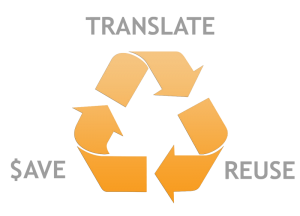 Translation memory is an application that allows to store the translations already carried out for a pair of languages, creating correspondences between text strings, storing them in a general memory. In this large container are added a lot of information that is useful to the translator when translating a text, for example in the context of a project. What advantages does the translator use a translation memory? First, you will find suggestions for the translation “inherited” from previous works inserted in the translation memory, that is, it can use the strings already translated and save a great deal of time. Secondly, he could find suggestions on terms or expressions that he does not know or on which he should have reasoned for a long time, which may have been recorded by another translator of his team. Last but not least, TM allows for a uniform translation, ie showing the translator how an expression has already been translated. For example, in the context of a technical project it could be fundamental for an engineer to find a term that is always translated in the same way, so as not to have doubts or to make confusion regarding its meaning. Kasakova Traduzioni produces a dedicated TM for each major project. This is a choice of reliability, quality and uniformity for the translation and for the final result to the customer. In years of work we have accumulated a great know-how in this sense and an immense database.